NEET Products launches a new laptop bag that separates chords, keeps them tangle-free, and features multiple storage pockets. When traveling out of town or headed to the local coffee shop, keeping a laptop protected is crucial. NEET’s new laptop bag has everything covered. From the people who helped get those tangled cords under control... introducing NEET's new laptop bag. NEET is the perfect solution to untangling the clutter around the house, office, or even on the go. Known for keeping electronic cords protected and organized through a simple-to-use cable management tool, the passion behind this project was to improve people’s lives and eliminate frustrations when it came to staying organized and keeping cables controlled. This bag was also created to organize, protect, identify cables and more. 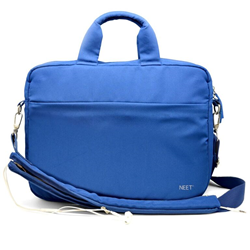 The NEET Laptop bag retails for $59.99 and is available in black, blue and red. To be among the first people to own one, order yours now at a discount at NEET kickstarter here, before they sell out! Save space and hassle in your life with an easier way to control those cables on the go. For more information email check out their kickstarter, or email ​Sammi(at)chicexecs(dot)com.